Israel cradles a special nook of the world, a compact slice of land near the confluence of Africa, Asia, and Europe. In an area smaller than New Jersey, this tiny country packs a huge variety of landscapes—from the snowy flanks of Mount Hermon in the north, down to the shimmering coast of the Mediterranean Sea, through the Negev Desert, all the way to the Red Sea. Here, some can't-miss natural wonders of this surprising country. To get to the top of Israel, you have to head north to Golan Heights, a high plateau that presses up against 9,232-foot Mount Hermon. The highest point in Israel is on the mountain's flanks, at 7,336 feet, not the peak itself (that belongs to Syria, but be careful who you ask). In winter it snows enough that you can ski at Mount Hermon Ski Resort, a 1,200-acre resort with five lifts. 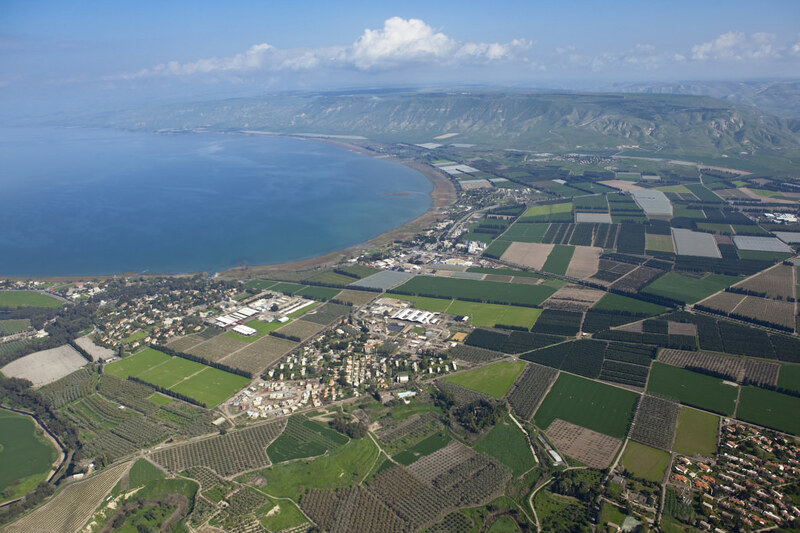 The Sea of Galilee, Israel's largest freshwater lake, spans 66 square miles in northern Israel and is laden with legends. Here you can follow the footsteps of Jesus—this is where legends say he walked on water, calmed the storm, delivered sermons, and fed the masses. Today travelers flock to beaches, campsites, hotels, and religious sites along the 33-mile shore. To earn a higher view, hike to the top of Mount Arbel in Arbel National Park and Nature Reserve, which also has a cabled route down a cliff to a 16th-century cave fortress. Israel's west coast hugs the Mediterranean Sea for nearly 170 miles, with cerulean waves that caress a sandy shore. 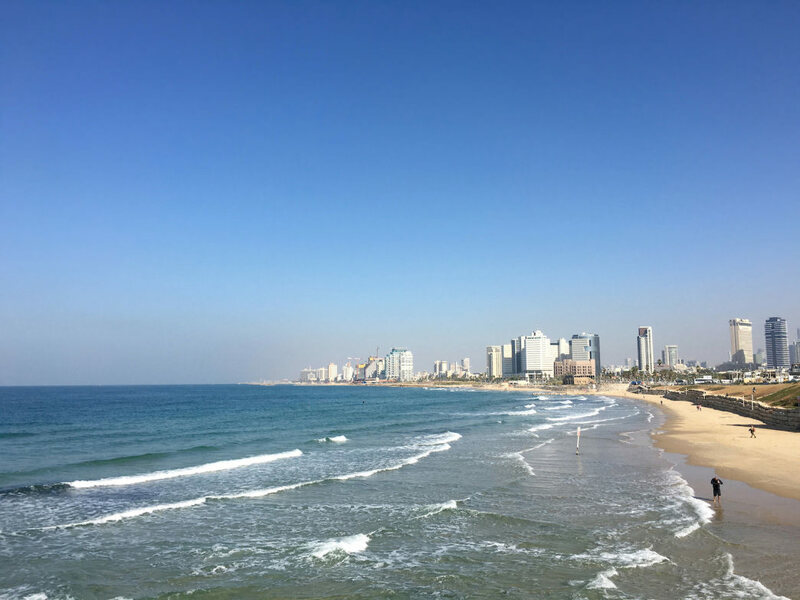 Tel Aviv wraps along a prime stretch, a magnet for sun-loving city slickers who come to work out or catch rays. Farther north, Israel's third largest city, Haifa, is also on the Mediterranean. Midway between the two, the remains of Caeserea, a first century BC city built by Herod the Great, are worth a look. No matter what, find some time during your stay to kick back on the sand. The lowest point on Earth, the Dead Sea dangles like a turquoise pendant 1,400 feet below sea level in the Jordan Rift Valley. 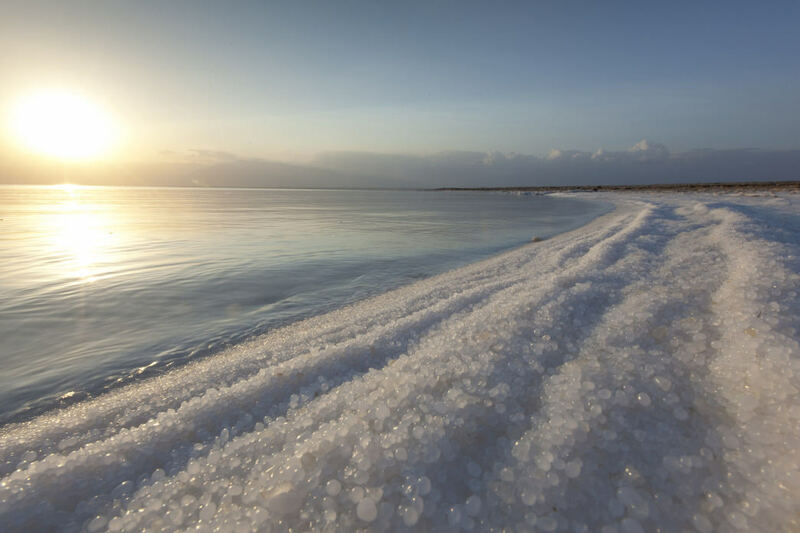 It spans 40 miles at its widest point, trapping water from natural springs and the Jordan River, which evaporates and leaves behind a briny pool with 34 percent salinity—10 times saltier than the ocean. Cover yourself in healing mud, tiptoe across the salty shore, and float effortlessly in the buoyant water. 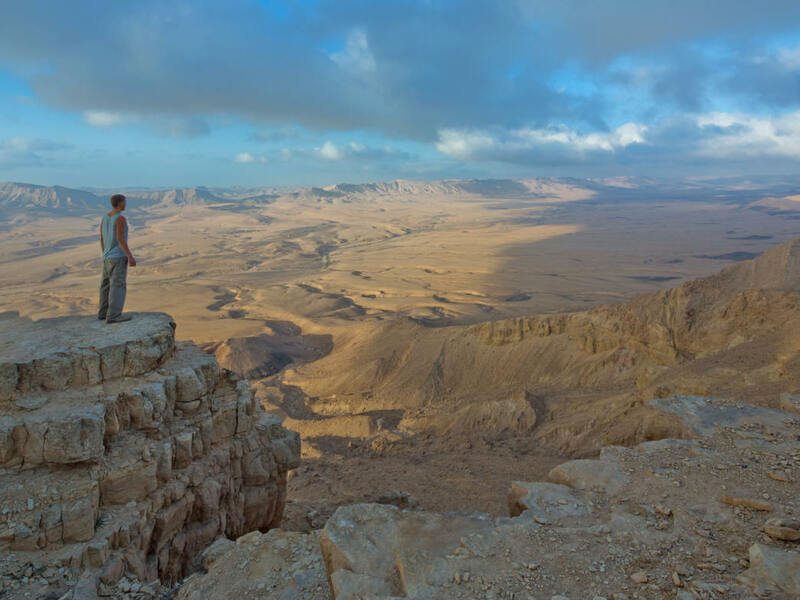 The Negev Desert spans the southern half of Israel, tapering down to a point on a northern finger of the Red Sea. Punctuated by deep craters and rocky peaks, this desert landscape is parched and vast. Steep escarpments crumble down to sandy expanses interrupted by occasional acacia trees. Ibex, with their huge arched horns, bound amid the rubble and nibble on grasses and leaves, which seem few and far between. Against the tan scenery, the blue sky seems to stretch into eternity. 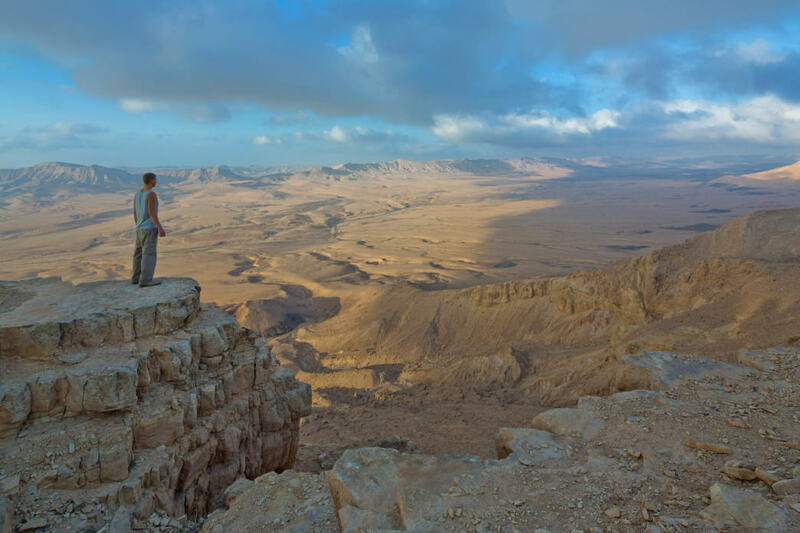 A highlight of the Negev Desert is Makhtesh Ramon, a 25-mile wide crater that is more than 1,500 feet deep. The best way to take it in is to hike up through the 200 million years of layers, following a trail that tops out on the limestone-crusted rim. 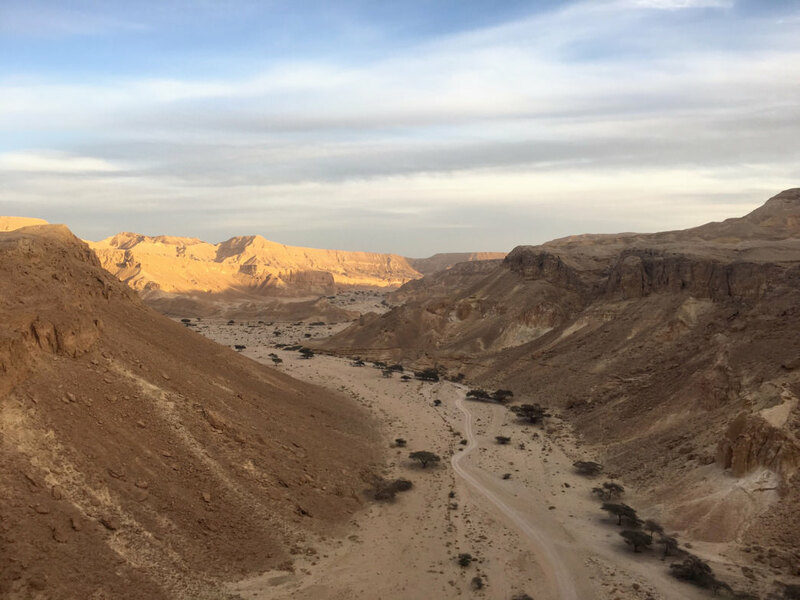 At the southern tip of Israel, the tan hills of the Negev Desert cascade down to the blue-green waters of the Red Sea, a long inlet that stretches almost 1,400 miles from the Indian Ocean. Israel's coast is a short span wedged between Egypt and Jordan. 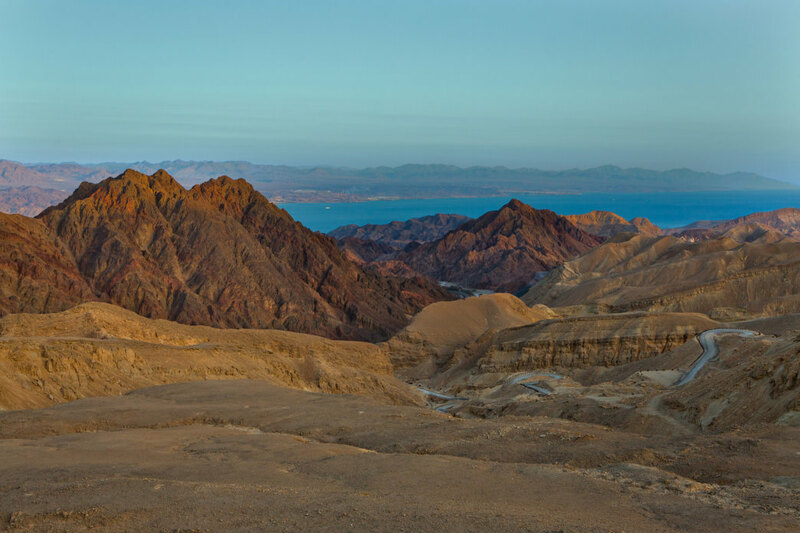 Get a glimpse of the underwater action at Coral Beach Nature Reserve, which is slightly south of the jam-packed action in Eilat, a popular Israeli holiday spot. Israel is for the birds. The country forms a narrow, fertile land bridge across the Middle East that provides a key refueling station for birds migrating between Eurasia and Africa. A billion birds a year make a pit stop in Israel. 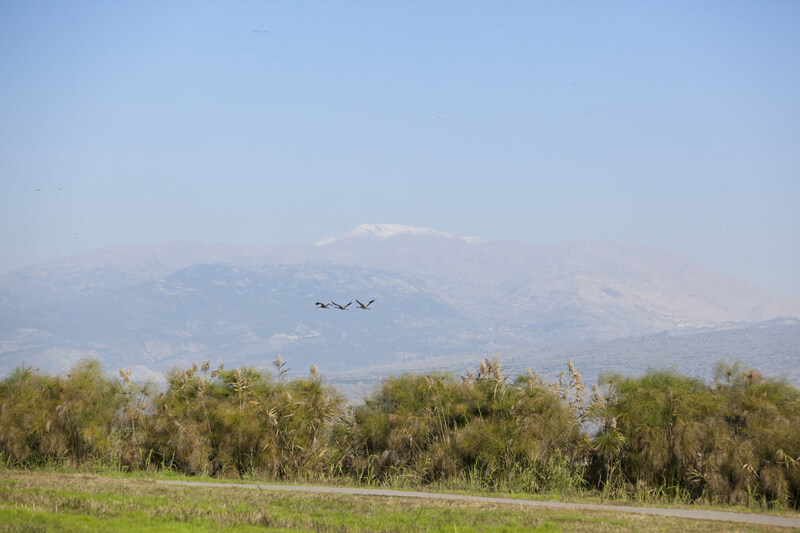 An excellent viewing spot is the Agamon Hula Ornithology and Nature Park in the Hula Valley, which funnels over lush wetlands in northern Israel.